Well, folks. I said on the show that when I beat this game I would write up a review for it and here it is. My total play time ran somewhere around over 80 hours long. I'll put up the exact number next time I pop in the game or closer to exact since I didn't save at the end to go on the "hero's quest." This was an awesome game. 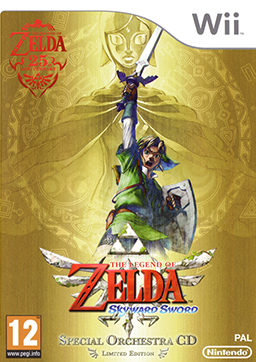 Skyward Sword is for the Wii but you also need Wii Motion or Motion Plus. The controls were easy enough to follow through. It does take more accuracy for the different sword strikes to be completed. I fidget a bit when playing and had to re-center the controls a lot but it wasn't really annoying. I think the worst of it comes when I shoot arrows with Fledge. I start off centered but as I continue to ready my bow, my center continues to drift to the right. That could just be me though and not have so much to do with the game. The story goes that Link and Zelda live in Skyloft, a town in the sky that had been broken off from the rest of the world by the goddess, Hylia. She did so and hid the Tri-Force there in order to protect it from the power-crazy villain, Demise. She then sealed Demise away within the Sealed Grounds located near Faron Woods. Link's training to become a knight. The day of the big ceremony, Zelda and he are playing out the roles of the goddess and her chosen hero when they both get pulled in to the roles they were destined for. Zelda falls through the clouds and is then hunted by the evil forces, all being led by Ghirahim, the guy trying to resurrect Demise. Zelda winds up being saved by an agent of the goddess, Impa. She looks after Zelda and brings her to various locations, praying to the goddess in order to make clearer her role, all until Link has trained and battled enough so that he can protect and save Zelda and then the world. These Zelda games can be very difficult to beat. When Tash and I discuss the games, he always recounts the game that he could never beat. When I played Twilight Princess, I never would have beat that game unless I looked up walk-throughs and cheats. The brilliant thing about Skyward Sword is that the game acknowledges the fact that there may be some points in the game that are too difficult to figure out on your own, so there is a handy character back in Skyloft that you can always fly back to. He'll show you short videos that explain exactly what you have to do in order to move forward. Not only that, but you have the character in your sword, another agent of the goddess, who will give you hints and assess different foes and ways to beat them. AWESOME. It makes the game just difficult enough. You don't have all these hints and stuff in your face all the time so you do get to try and figure out all the puzzles on your own. An interesting point in the game is that you fight Demise very early on after you've passed through the clouds. Of course, you don't realize it. You fight him on a couple more occasions and then at the end when he is at his peak strength. I love love love the song that Zelda sings at the beginning in Skyloft. I wish it came on the bonus CD with the game. I really liked this game. I beat Demise on my second try. The first time, I didn't have my necessary potions with me or anything so I knew I wasn't going to beat him but I wanted to see what it would be like to try. The second time, I first ran about and did all of the side quests for characters in Skyloft, payed for my potions and then beat Demise. Victory! Technically I still haven't finished the game. I still need to reach 600 points shooting arrows with Fledge. I keep averaging around 300-400 points. If you sat next to me while I was playing this you would hear me say, "Maybe I could reach 600 points if you threw your pumpkins a little more consistently, Fledge?!!!!" I, also, need to get top score in Fun Fun Island. I keep missing one ring to dive through and I get nowhere near the 50 rupee mark.